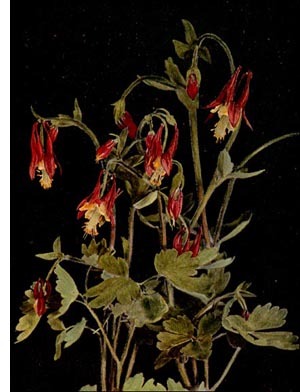 Botanically, the Columbine is called Aquilegia, from the Latin word Aquila, meaning an eagle, in reference to a fancied likeness of the spurs of its flowers to the talons of an eagle. It is one of the crowfoot family. This pretty and herbaceous perennial is distributed over most of the north temperate zone and, if not altogether a child of the mountains, it may be sought in rocky or stony localities. One is surprised to find the graceful Columbine defying the storms, with its roots carefully fastened in the deep crevasses of the rocks of rugged mountains and protruding its nodding flowers above some steep ledge where human foot has never trod. To many a weary wayfarer this little hermit flower has brought joy and pleasure. Though attractive to the lover of flowers, it is not met with in folklore nearly as frequently as many other species of plants that are far less attractive. The genus aquilegia includes about twenty species and an endless number of varieties, produced by the skill and intelligence of the gardener. The United States can claim the prettiest of all the species of this widely distributed group. One species is the wild columbine of our illustration. It is common everywhere. Here it is found covering rocky hills, softening the harsh gray of the rocks with its delicate foliage; there it enlivens the woodland borders with its nodding and pretty scarlet flowers, which are lined with bright yellow. Though it has been stated that the columbines prefer the rocky hillsides, it must not be supposed that they will not tolerate a home in the border of a garden flower bed. Like many other plants of a similar nature, they thrive under cultivation, where a sunny and sheltered position is more suitable. One of the most beautiful of the garden varieties, or hybrids, is the double-flowered Skinner's columbine. The columbines have been called "the flowers for the masses." Once started in the garden, they will propagate for years, and, although perennial, they increase rapidly by self-sown seed. The young plants will acquire sufficient size and strength before the close of the growing season, to endure the trying winter weather.